Home bearing What is a pillow block bearing? 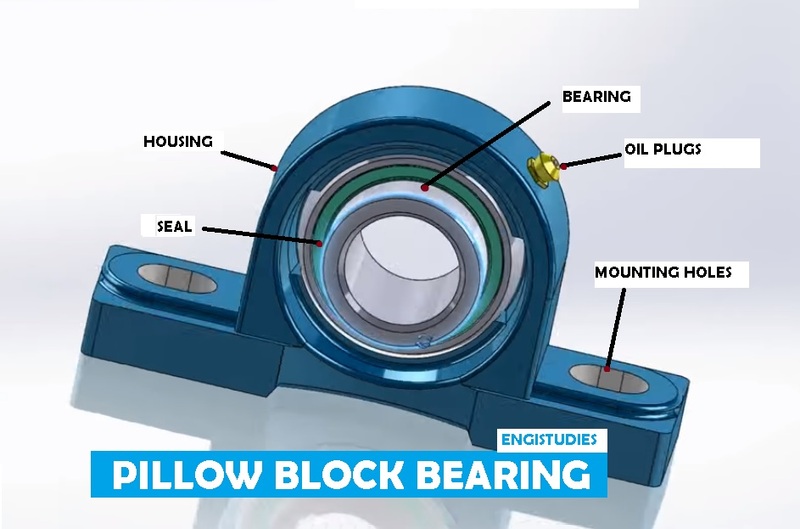 What is a pillow block bearing? A pillow block bearing is generally designed to support the rotating shaft with the help of bearings that are housed inside the special body. The housing or mounting body is usually made up of Cast Iron. The pillow block bearing is used in light load applications. The plummer block may consist of spherical roller bearings or self-aligning ball bearings. This is the main body part which performs the basic function of supporting the rotary shaft. It may be a ball or roller type bearing. The bearing material generally used are Steel, stainless steel, sintered metals, graphite metal & Some type of plastic. It is made with high strength cast iron or cast steel. It is present to seal the lubricant. It basically prevents leakage of lubricant outside of the bearing. To lubricate the bearing this hole is used. These are usually slotted type holes used to mount the unit. This allows for easy positioning during the installation. The bore diameter is machined with H8 tolerance. When designing shaft one should refer to the manufacturer's catalog, for example, NTN pillow block bearings. We can get variation in bore size, bearing or block material and in similar other things.